This is a Type V PFD because the inflation system is convertible between automatic and manual operation. 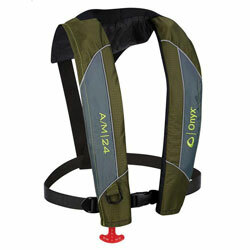 Substitutes as a Type III PFD ONLY WHEN WORN and used in accordance with owner's manual. Approved only for use on recreational vessels, not approved to meet carriage requirements on commercial vessels.